Center for Rheumatic Diseases, Pune, India. 59/2, Kausar Baugh, Kondhwa, Pune - 48. India. There are many forms of arthritis and rheumatism that differ in their treatment and outcome. Newer modern medicines are highly effective and fairly safe when used correctly. Even the patient with the worst form of chronic arthritis can hope for effective long term relief. Yet, all over the world, arthritics continue to suffer. Often, this is due to poor communication with the doctor, and some very basic misconceptions and wrong information about the disease. This book aims to provide the initial basis for initiating a useful dialogue with the doctor. It is not a substitute for the doctor. Nor is it a therapeutic guide. 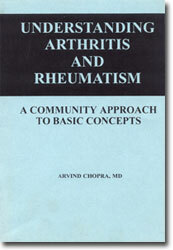 This book is part of a ‘health education effort’ launched in village Bhigwan (Pune District) since 1996, under the auspices of the World Health Organization (WHO) community program for control of rheumatic diseases (COPCORD) in India. COPCORD, a joint venture of WHO and ILAR (International League of Associations for Rheumatology), is monitored in Bhigwan by APLAR (Asia-Pacific League) and IRA (Indian Rheumatism Association). The book contains ‘questions and queries’ collected from over 3000 patients of arthritis evaluated in medical camps in Pune and Bhigwan COPCORD region. The Bhigwan COPCORD population has demonstrated that the commonest health problems, ranging from mild to severe, belong to the musculoskeletal-rheumatic group. Numerous arthritis and rheumatic problems exist in the Indian population. Overall, rheumatic ailments significantly affect people’s lives and work output. Chronic arthritis can be deforming and disabling. Health education, often lacking, can further improve the response to medicines. Mr Bill Wilcox, executive director, Arthritis Foundation of Australia, has been an inspiration in my quest to understand the expectations of the community from doctors, rheumatologists in particular. Bill is an ardent advocate of community driven health education program and research. And this book is a beginning in that direction. Dr. N Khaltaev, Co-coordinator, Division of non-communicable diseases, from WHO HQ, visited Bhigwan in March’99, and endorsed the need for such a book. This publication has been sponsored by WHO for free distribution to the patients in the Bhigwan region. I humbly acknowledge the contributions of numerous colleagues. Mr. Meherdil Irani, a young brilliant artist from Pune, volunteered his services and drew the cartoons. Dr. Jayshree Patil, has assisted in translation of the book into Marathi language. Ms. Manjit Saluja has looked after the secretarial work and the logistics. The publishers, Mr. Nazim Shariff in particular, has worked on this project with overwhelming sincerity and devotion. My family has constantly inspired this effort. Finally, I acknowledge with gratitude the support obtained from WHO COPCORD and Dr. Khaltaev, and my colleagues from village Bhigwan-Pune District (Dr. H. S. Tandale in particular). I sincerely hope and pray that this book will inspire patients to know more about their illness and despite their arthritis help them to lead a healthy productive life.